Textbook Updates: In 2014, Sherwin-Williams changed the method used to import paint color swatches into your Revit models. Sherwin-Williams now distibutes paint materials using an Autodesk Material Library Files (ADSKLIB file). The photorealistic material families described on pages 230–231 are no longer available for download. The instructions below replace pages 230 and 231 in the textbook. Step 1 (not shown): DOWNLOAD the SW ProMar 200 Semi-gloss library from Autodesk Seek. Step 2 (not shown): Open your Revit project and click the MATERIALS button in theMANAGE tab. Step 3: CLICK the OPEN EXISTING LIBRARY icon in the Material Browser. Step 4 (not shown): OPEN the SW ProMar 200 Semi-gloss Paint Library downloaded in Step 2 above. Step 5: SEARCH for 6244 in the material library. Step 6: CLICK the ADD MATERIAL TO LIBRARY button in the SW paint library. Step 7: CLICK the OK button to add the material to your project. 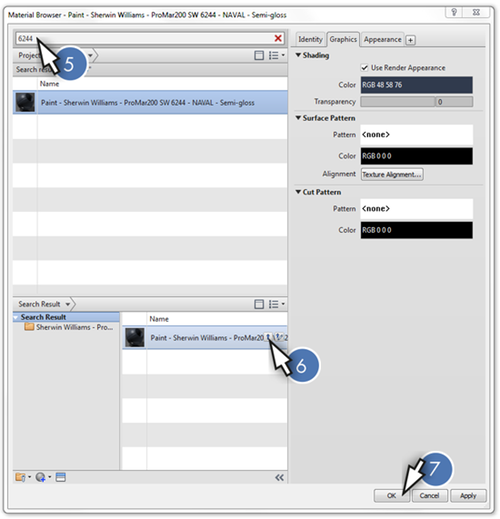 Repeat Steps 5–7 to search for and add SW 7667 and 7076 to your Revit project. Continue instruction on page 232 of the textbook. This video by Sherwin-Williams, shows you how to load the material library file into your revit project. 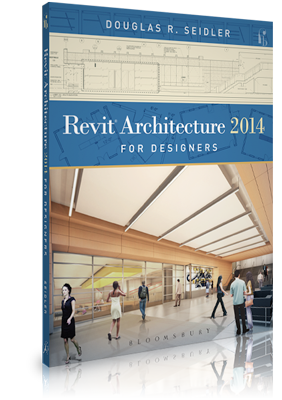 I recommend you use the Sherwin-Williams ProMar 200 Zero VOV ADSKLIB file with this textbook and your interior Revit projects.